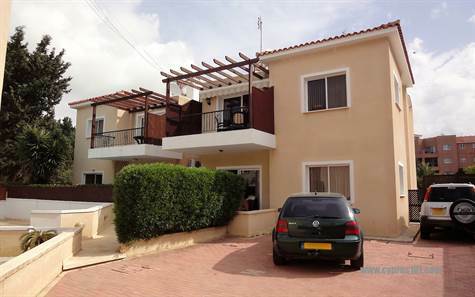 Kato Paphos, Paphos - Cyprus - This detached top floor two bedroom apartment is superbly located in a quiet residential street very near the renovated harbour area of Paphos which has a wonderful traditional atmosphere and a wide range of restaurants, shops and coffee bars. The coastal walks are a delight, as are the many beaches scattered along the promenade. Being a small project of eight apartments with the swimming pool at it’s centre, it has a nice community feel and is very well maintained. The property features a light and airy open plan living room including comfortable lounge and spacious kitchen with fitted breakfast bar. Patio doors from the lounge open onto a large pergola covered balcony - a perfect place for outdoor dining. The kitchen is well equipped with built-in oven, electric hob & extractor fan, fridge freezer, washing machine and microwave. A hallway leads off the living room to two good size double size bedrooms including fitted wardrobes. The master bedroom also features a built-in dressing table with mirror. Also accessed via the hallway is a large bathroom with double fitted shower and modern finishes. There are few quality properties such as this available for purchase in this particular area of Kato Paphos which is considered to be prime location. It is ideal as a holiday home and/or rental investment, furniture is included and there are full title deeds.